Plantar warts are noncancerous growths that develop on the soles of the feet as a result of the human papillomavirus (HPV). HPV enters the body through tiny breaks in the skin, which are often present beneath pressure points in the feet on the heels or balls. 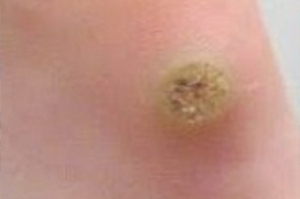 These warts appear on the skin as a small, hard bump that may be gray or brown with well-defined boundaries. In some patients, they may cause pain or tenderness with walking. While plantar warts are not usually a serious condition, many patients experience pain or embarrassment regarding this condition and may desire treatment for comfort or aesthetic motivations. Patients should seek medical attention for warts that are painful, change appearance or color, multiply or interfere with normal activities. It is important for patients with diabetes or circulatory disorders to seek immediate treatment in order to reduce the risk of serious complications. Plantar warts can be removed through several different noninvasive procedures, including cryotherapy (freezing), laser surgery, cantharidin, immunotherapy and medication injections. These outpatient procedures are usually effective in removing warts with little to no scarring. Our Doctor's will decide which treatment option is best for you based on your individual condition. Some plantar warts may not require any treatment at all. Patients can reduce their risk of developing plantar warts by keeping the feet clean and dry, avoiding direct contact with warts and avoiding walking barefoot in public areas. To learn more about Treating Plantar Warts & Podiatric Services, please contact us at 410-749-0121410-749-0121 today or click here to schedule an appointment.